Fans are mechanical units designed for air transportation in the ducts, direct air supply or air exhaust from the premises. 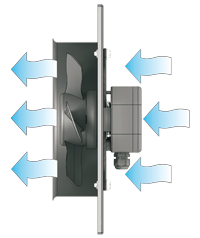 Air is moved due to the pressure drop between the fan inlet and outlet vent. An axial fan has the form a cylindrical-cased wheel with the impeller fixed to a bushing at some angle to rotation plane. As the impeller blades rotate air is trapped betwen and is moved further axially. Air is hardly moved in the radial direction. 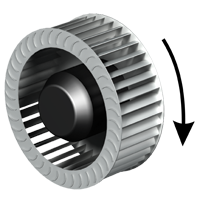 The axial fan blades are mostly set directly on the motor shaft. Application: air supply and air extract through openings or assembled to max. 3 m air ducts at low air dynamic resistance in the system. A mixed-flow fan is able to move air along the motor shaft. Such fans are widely applied in the ventilation systems with round air ducts. Round inline fans are available in standard sizes ranging from 100 up to 450 mm with the air capacity range from 250 to 5200 m3/h. The impellers with backwardcurved blades are powered by the asynchronous external rotor motors. The ball bearings are rated for long service life. The fan casing may be made of plastic, polymer-coated or galvanized steel and has good corrosion-resistant properties and a nice look. Application: air exhaust and supply in long ventilation systems with high air dynamic resistance. A centrifugal fan consists of an impeller and a scroll casing. An impeller is a hollow cylinder with mounted blades inside, circumferentially fixed with disk plates. 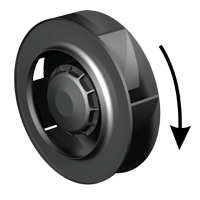 The hub for mounting the impeller on the shaft is located at the center of the strengthening ring. During the impeller operation air is trapped between the blades, gets compressed and is moved from the center. Under centrifugal force air is transported to the scroll casing and then moved to the exhaust pipe. 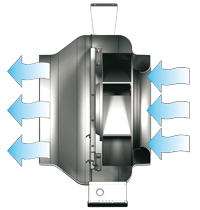 The centrifugal fans are equipped with forward or backward curved blades. Backward curved blades enable up to 20% energy saving. Another important privilege of backward-curved blades is their high air overload capability. Centrifugal fans with forwardcurved blades ensure the same air capacity and pressure characteristics as the backward-curved blades do but they require smaller impeller diameter and lower speed. So they are able to attain the required result demanding less space and producing less noise. 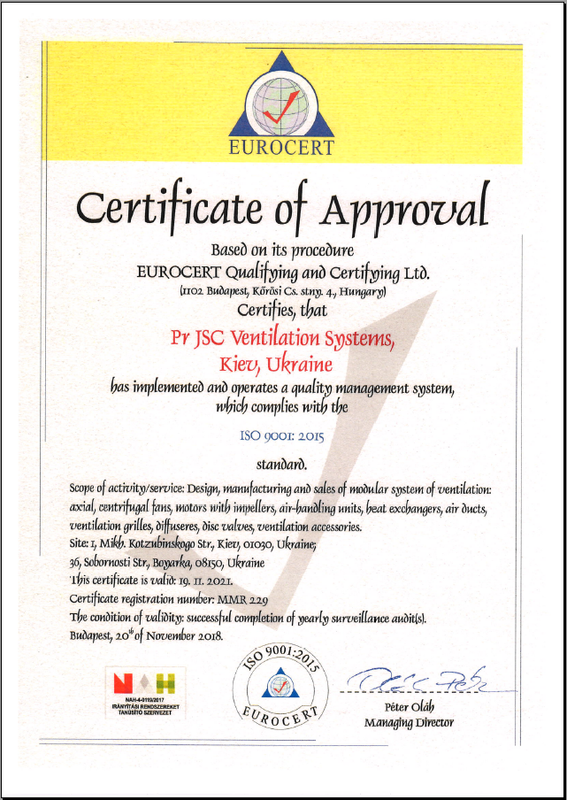 Application: air exhaust and supply in ventilation systems with long air ductworks and high air dynamic resistance.